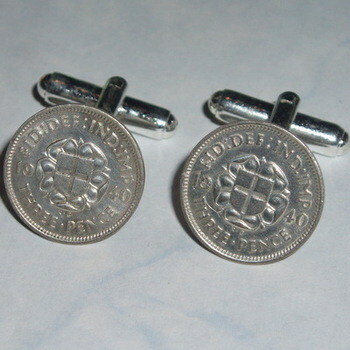 Pair of Silver Threepence Coin Cufflinks. Really quirky and unusual Silver Threepence Cufflinks. These Handmade cufflinks have real Silver Thruppenny Coins mounted on silver plated cufflink backs. Also called Silver Thropence coins. Perfect Birthday or Anniversary gift. I can make these cufflinks most dates from 1913 up to 1937, please fill in the date box with with your requirements. Allow up to 14 days for dispatch as I have to source the coins.